I don&apos;t know about you, but when I was 20 years old, my idea of a fancy look was a going-out top and a pair of dark wash jeans. No, I won&apos;t tell you what year that was. Yes, the going-out top was from Express, how did you know? 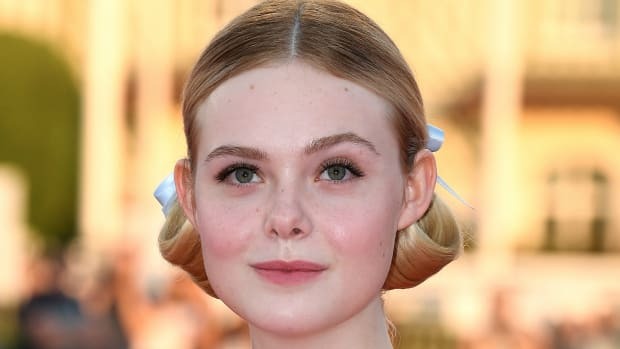 Anyway, we live in better times for style and, additionally, Elle Fanning is no typical 20-year-old. Where a big night out for me included $5 pitchers of beer (which I did not drink because I was not 21, obviously, Mom!) and sticky bar floors, Fanning&apos;s fancy occasions are usually movie premieres and the like, so she has a better excuse to wear some truly show-stopping stuff — like this flamingo-pink lace dress from Rodarte. The summery-bright dress has a lot going on — a plunging neckline, a perfectly-fit hourglass shape, sparkling lace, delicate floral detail — so Fanning and stylist Samantha McMillen smartly keep the rest of the look simple, accessorizing with just a few sparkly rings from Tiffany and Co. The beauty touches are what takes this outfit to the superstar level. Makeup artist Erin Ayanian Monroe used a L&apos;Oreal Lip Dew (that I suddenly need quite desperately) and a shimmery eyeshadow for a sweet, Barbie-worthy look. Hairstylist Jenda went for a &apos;60s-esque flip to finish things off, giving Fanning very "Catherine Deneuve in &apos;Umbrellas of Cherbourg&apos;" vibes. I don&apos;t know where that headband is but I am obviously willing to cut off my own arm — my left, I don&apos;t use it that much anyway — to get my hands on it. Or hand, I guess. Also, she's back to blonde and I think I kind of missed it?